Further to my updates earlier this year, I want to advise you that Dublin City Council will be carrying out the re-surfacing of Church Road in the coming weeks. These works will result in the temporary closure of Church Road from the junction with Shelmalier Road as far as the junction with Blythe Avenue. Prior to their beginning, Dublin City Council will communicate with households as to temporary parking arrangements for the duration of the works period. The City Council envisages that the works associated with the re-surfacing of the street will take place between Monday 23rd October 2017 and Sunday 29th October 2017. The Roads Maintenance Division of Dublin City Council successfully sought the temporary closure of the street to facilitate the resurfacing of the road but pedestrian and local access will be maintained for the duration of the works. I hope this information is of assistance to you. However, if you have any questions or queries arising from the details provided, please contact me at raymcadam@gmail.com. The Public Domain Unit of Dublin City Council has been removing incidents of graffiti from various buildings and locations across East Wall. The Council’s Corporate Contractor and its own Waste Management Services have removed graffiti along West Road, Church Road, East Wall Road and Seaview Avenue. If there are items of graffiti on your street or avenue, please contact me at raymcadam@gmail.com and I will arrange for its removal. I am delighted that the Roads Maintenance Division of Dublin City Council has now carried repairs to damaged speed ramps across East Wall which I worked to secure funding for earlier this year. Repairs and improvements have been undertaken to ramps at Church Road, at the junction of Forth Road with East Wall Road and the junctions of East Road with Caledon Road, Ravensdale Road and Bargy Road. Across the coming weeks, I will be meeting Roads Maintenance officials to identify streets across the East Wall district that require resurfacing and should be included in the 2018 North Inner City works programme. At the North Inner City Area Committee meeting this month saw an emergency motion put forward by me and Councillor, Burke for Dublin City Council to develop an East Wall traffic management plan was successful. The current situation being experienced by East Wallers in no longer acceptable and Senior Engineers in Dublin City Council need to start thinking outside the proverbial box in order to ensure that the increased volumes of traffic using local roads is better managed. Local householders and businesses have been in touch with me looking for action to be taken in a coordinated manner. 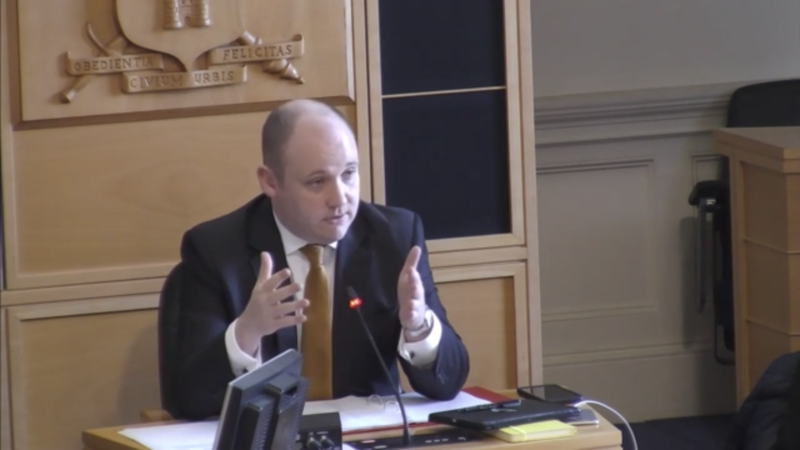 The emergency motion which was successful on Tuesday called upon senior management in the Transportation Department of Dublin City Council to present a draft plan by Christmas that can form the basis of a public consultation across East Wall early in 2018. As Chairman of the North Inner City Area Committee, I have now sought to ensure the senior engineers attend next month’s meeting to start work on developing this plan. It is my intention to keep this issue on the City Council’s agenda every month until an effective traffic management plan is put in place for East Wall which has the support of residents in East Wall! As Halloween approaches, the Public Domain Office of Dublin City Council will direct Litter Wardens to visit tyre retail premises to ensure that tyres are properly disposed. Furthermore, litter wardens will seek to ensure that premises reduce waste tyre stock in. Litter wardens will also contact Market businesses regarding the storage of pallets within markets located across the North Inner City. Environmental Services officers will also monitor and inspect sites or properties that have ‘traditionally’ been used as storage areas for tyres and pallets. If you come across any materials for bonfires being stored nearby, please contact either myself or the Public Domain Officer at 1800 248 348 or litter.central@dublincity.ie. • Deploying hi-visibility patrols throughout the North Inner City to tackle any anti-social behaviour, or other criminal behaviour. • Deploying an overt Public Order Unit capability on Halloween night across the North Inner City. • Establishing a liaison with City Council Area Managers and other agencies to ensure there is a co-ordinated approach to help reduce the availability and prevent the use of tyres as combustible material. • Intelligence led operations to prevent and detect the organised importation for the sale of fireworks, between now and Halloween. • Auditing areas across the North Inner City for skips and ensure that all skips are removed or properly secured to prevent the contents being set alight. These plans are designed to ensure public safety and an environment conducive to the public’s enjoyment of this holiday period. The Dublin Central Area Office of Dublin City Council will shortly begin a pilot programme to help reduce the scourge of dog fouling across the North Inner City. Officials have identified two areas where the pilot programme will be targeted in. Dog dispensers and bins will be installed at the entrance to Fairview Park and Whitworth Road near to the Royal Canal way. City Council officials will monitor the dispensers to ensure their effectiveness. This will determine whether the pilot scheme becomes more widely used across the North Inner City by Dublin City Council. COMMUNITY GRANTS SCHEME 2018 – APPLICATION PROCESS OPEN! The Dublin City Council Community Grant Scheme is now open for applications. The closing date is the 27th October 2017. All applicants for the 2017 scheme will be sent an application form for next year’s scheme. ALL APPLICATIONS should be returned to: Community and Social Development, Block 3, Floor 1, Civic Offices, Wood Quay, Dublin 8. More information can be accessed through http://www.dublincity.ie or by contacting the Community & Social Section of the Council at Tel:2222148 or by email at doce@dublincity.ie. Our Fine Gael-led Government recently announced details of a new grant aid scheme to assist local groups in establishing community-based CCTV systems. Under the scheme, eligible community groups can apply for up to 60% of the total capital cost of a proposed CCTV system, up to a maximum grant of €40,000. Upon approval of the grant, the applicant will receive an upfront payment of 50% of the grant with the balance to be paid when the system is fully operational. €1 million has been provided by the Government in Budget 2017 and it is planned that similar funding will be available across each of the next three years. Such community run schemes, when run in conjunction with a text alert scheme helps to give our communities an enhanced ability to be proactive about the prevention of crime locally. Further details of the scheme are available by contacting the Department of Justice at communitycctv@justice.ie. Since my last update on the dedicated cycle and pedestrian route along the Royal Canal, Dublin City Council has made some changes to the planned programme of works, which has delayed the start of construction work. With regards the stretch between Sheriff Street Upper and the North Strand, the Transportation Department has added the upgrade of the Seville Place/Sheriff Street junction to the scheme. The detailing and agreement of additional elements of work with relevant parties, receipt of supplementary ground investigations information, the development of a rodent eradication specification and further work for addressing invasive species which had spread significantly since the previous survey undertaken by the City Council contributed to the delay. The initial phase of the tendering process has now been completed with Council officials expecting the second stage to start in November. In terms of Phase III of the project, between the North Strand Road and the Phibsborough Road, the Council has had to review the documentation surrounding the cost of the project, meaning that tender documents should now be issued in December 2017. Therefore, no construction work will begin on the site until mid Spring 2018, which is disappointing. This entry was posted in East Wall, Fine Gael, Housing, Transportation. Bookmark the permalink.